Our English-speaking guide will pick you up from Tianjin Port, a comfortable with an experienced driver will take you to Beijing City ( about 3 hours). Beijing has many famous attractions, among which Mutianyu Great Wall is one. So our first destination is Mutianyu Great Wall which is one of the most famous part, the Mutianyu section enjoys a long history and is part of the glorious culture of China. It is also famous for the breathtaking beautiful scenery. We will take you back to hotel after visiting Mutianyu Great Wall. Our driver will pick you up in tne early morning and transfer you to the airport and take the fligth to Xian. After your arrival, our guide who will hold a paper with your name on and meet you at Xian airport. 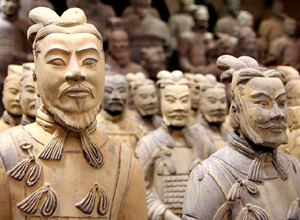 Our driver will take you to visit Terracotta Warriors which are the most significant archeological excavations of the 20th century. It is a sight not to be missed by any visitor to China. After Lunch, we are heading for downtown Xian for a visit to Xian City Wall which is one of the most famous attractions in Xian. It represents the oldest and best preserved Chinese city walls, as well being one of the largest ancient military defensive systems in the world. And then go to see the Big Wild Goose Pagoda that is built to store and translate Sanskrit Buddhist Scriptures that a monk brought from India. After the tour, we will take you to the airport and take the flight back to Beijing. Meet our driver at Beijing airport, transfer you to your hotel in Beijing. After breakfast, our tour guide will pick you up from the hotel, a vehicle with an experienced driver will transfer you to two famous attractions—Tiananmen Square which is the world’s largest city center square and Forbidden City, a home to 24 emperors in Ming and Qing dynasty. After having lunch, continue our trip to Temple of Heaven which was the venue for the Ming and Qing emperors to offer sacrifices to the Heaven and pray for harvest. After ending the tour, you will be transferred back to Tianjin Port.